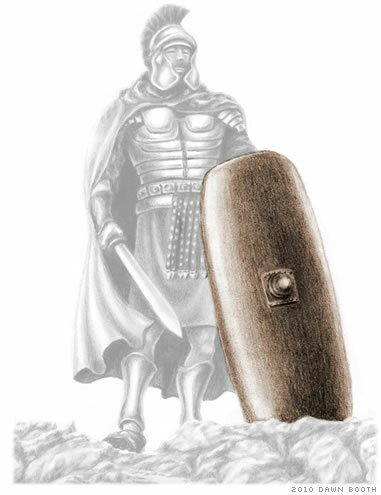 The fourth piece of armor Paul mentions in Ephesians 6 is "the shield of faith." How did Roman soldiers use their shields? What purpose does a spiritual shield serve for us? The three young men stood looking at the very site where they were to be put to death. The edict had gone out—they were to be thrown, alive and bound, into a furnace heated to seven times its usual fervor. Everyone watching understood: This was an execution. This was what happened when you disobeyed the king. Just moments ago, the three men had been given the chance to circumvent this ugly fate. With little more than a few motions on their part, they could have saved their own lives. But they refused. Why? The king had previously set up a 90-foot-high golden statue. At various times throughout the day, which were to be prompted by music, he commanded that his people fall down and worship this statue. Out of the entire nation, we are given the names of only three men who had the courage to stand against this royal decree. And for that courage, Shadrach, Meshach and Abed-Nego were going to die. When King Nebuchadnezzar became aware of their insubordination, he summoned the rebels and gave them an ultimatum: Worship the statue or be thrown into a fiery furnace. Their response is preserved for us in Daniel 3:16-18. "Shadrach, Meshach, and Abed-Nego answered and said to the king, 'O Nebuchadnezzar, we have no need to answer you in this matter. If that is the case, our God whom we serve is able to deliver us from the burning fiery furnace, and He will deliver us from your hand, O king. But if not, let it be known to you, O king, that we do not serve your gods, nor will we worship the gold image which you have set up.'" The faith of these three men in God allowed them to stand up to the world's most powerful man and refuse to follow his blasphemous orders. They were then thrown into the furnace and miraculously delivered unharmed by God. But perhaps the most amazing thing about their story is their unwavering dedication to God in the face of an unknown outcome. Their faith was strong enough to accept giving their lives! How can we have that faith? Taking the Shield Up until now, Paul's description of the armor of God has been limited to items we wear. We put on the belt, the breastplate and the shoes, and they essentially hold themselves up. The shield is different. Paul tells us that the shield is something we must take up, something we are required to raise. Just strapping it to our arm won't do any good at all if we don't make the effort to hold it aloft and use it. How did the shield work in the Roman army? The Roman shield—the scutum—was not the standard "medieval-esque" shield most picture in their minds upon hearing the word. It was instead a very large, slightly curved rectangular shield featuring at its center a large metal knob (called a boss). The scutum was an impressive line of defense. Because of its sheer size (some were three and a half feet tall and almost three feet wide), soldiers were afforded a great deal of protection from enemies. Because of its slight curve, it was able to deflect attacks without transferring the full force of the assault to the man holding the shield. Because of its boss, it was able to deflect even the more vicious blows and function in a limited offensive capacity as a means of knocking an opponent backwards. Here is a biblical definition of faith that clears up some common misconceptions. If faith is "the substance of things hoped for, the evidence of things not seen," then this has far-reaching implications. Substance is tangible, and evidence is solid proof. Faith is, by definition, not some hazy emotion without any grounding in reality. It is the irrefutable truth. It is real. Though it is based on solid evidence, that doesn't mean faith comes naturally or easily. Paul here makes the obvious but necessary point: You don't hope for what you already have. Faith involves a huge element of trust. We must examine the evidence and see that God has proved Himself to be unchanging and consistent, and then we must firmly believe that He will fulfill His promises to us. Where does living, saving faith come from? While we must believe God to even begin our walk with Him, after repentance and baptism He gives us a deeper, living, growing faith through His Holy Spirit. A shield guards. While a physical shield protects us physically, faith can protect our spiritual lives even in the middle of physical trials. When Satan (through Nebuchadnezzar) attacked the values and beliefs of Shadrach, Meshach and Abed-Nego, they were able to stand resolute and unwavering because of their faith. In their response, they essentially said, "God is capable of delivering us from this fate. We don't know if He will or not, but that doesn't matter. He gave us His commands, and we are going to keep them regardless of the physical outcome. We know He can just as easily raise us from the dead." ...above all, taking the shield of faith with which you will be able to quench all the fiery darts of the wicked one. A shield deflects. Satan is always hurling his fiery darts of fear, doubt and worry in our direction, but the only time they can hit us is when we let our shield of faith down—when we stop believing that God is in control; that He is working everything out for our good; that whatever happens is for the ultimate best of everyone involved, however little it seems to be that way. And Peter answered Him and said, "Lord, if it is You, command me to come to You on the water." So He said, "Come." And when Peter had come down out of the boat, he walked on the water to go to Jesus. But when he saw that the wind was boisterous, he was afraid; and beginning to sink he cried out, saying, "Lord, save me!" And immediately Jesus stretched out His hand and caught him, and said to him, "O you of little faith, why did you doubt?" A shield is the first line of defense. While the rest of our armor helps protect us from Satan's onslaught, it is not what you ideally want to be using to absorb every hit. You do not, for instance, go out into battle intentionally blocking everything with your head. When our faith in God's omnipotence and care is strong, it is impossible for Satan to break through our shield and land an attack. But when we allow doubt to creep in, as Peter did when distracted by the waves, we will start to sink. The rest of our armor will be battered, and so will we. But an actively raised shield of faith prevents this otherwise inhibiting fatigue. Then Jesus said to him, "Away with you, Satan! For it is written, 'You shall worship the Lord your God, and Him only you shall serve.'" Then the devil left Him, and behold, angels came and ministered to Him. A shield can incapacitate. When Christ was being tempted by Satan, His faith in the Word and commands of God repelled Satan for a time (Hebrews 4:15 tells us that Christ was tempted in all things, so this was certainly not the only encounter Christ had with the devil). The boss (the metal knob in the middle) on the Roman shields allowed soldiers to give their enemies a stun-inducing shove that would allow them to follow through with an attack. Our faith in God, as demonstrated by Christ, can also give Satan a good shove backwards and give us a chance to fight back by doing God's will and work. Because God tells us that faith cannot just be in our minds, it must produce actions—works of obedience and service (James 2:20). How else can the shield be used? The Roman military had an inventive and very effective tactic that made use of their large shields. When enemies would begin firing arrows and other projectiles at the army, the soldiers would close ranks into a rectangular array—called the testudo, or "tortoise," formation—and those on the outside would use their shields to create a wall around the perimeter. Then those in the middle would raise their shields over their heads to protect everyone from airborne missiles. The result was a formidable human tank that could be stopped only through a tremendous effort. When the Roman army joined its shields together, it became an almost unstoppable force. And if we in God's Church join our shields—that is, strengthen each other with our faith, building up and serving within the Body as we are able—we will become an unstoppable force able to take on any challenge. We must remember as we fight that this is not simply our battle. This is the battle of all our brethren, both near and around the world. And if we are to win, it will only be once we put our faith in God and stand side by side, contending earnestly and as one for "our common salvation...the faith which was once for all delivered to the saints" (Jude 1:3).